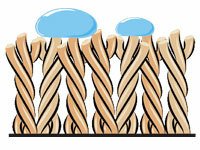 forms an invisible shield around each fiber, which resists soil and stains. Teflon® Advanced must be professionally applied by your carpet cleaner. It is applied by spray application, dries quickly, and leaves no odor. It is non-toxic and safe to use around family and pets. It’s CFC- and solvent-free. 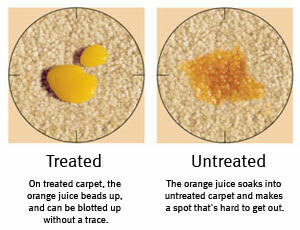 DuPont recommends the application of Teflon® Advanced after each cleaning on all carpet fiber types. Even wool carpets can benefit from DuPont’s special formulation for wool carpets. With an application of DuPont Teflon® Advanced Carpet Protector, you have the assurance your carpet is protected with a premium quality product.